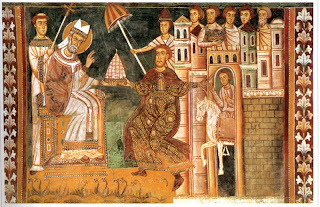 For those not familiar with it, the “Donation of Constantine” was a forged decree, purportedly by the Emperor Constantine (“the Great”), granting dominion of the Western Roman Empire to Pope Sylvester I in 4th century. If the decree were genuine, subsequent Popes would thereby have inherited dominion over the territory by right of succession according to the Roman Civil Law. The Donation was used to legitimate Papal authority in Western Europe, trumping the authority of kingly rulers. The Donation was fraudulent and was known to be so by the 15th century. Nonetheless, even if it had been genuine, the Church should have been wary of relying on it. Pontius Pilate, the Roman Procurator of Judea who handed Jesus over for execution, was portrayed in the Scriptures as a man ruling without right in a foreign land. Whatever putative political legitimacy he might have claimed derived ultimately from the Emperor at Rome — the same source from which the Catholic Church claimed to derive its similar powers via the Donation. Therefore, if Pilate lacked right and authority, then so too must the Church of Rome. However, let us assume that the Church was willing to grant the legitimacy of Pilate’s imperium over Judea, an imperium granted by the authority of the Emperor. If the Church had inquired from whence the Roman emperors themselves derived their authority, they likely would have found that it was based on usurpation and tyranny. If Constantine's title was acquired by usurpation, either his own or his predecessors', he could not have passed good title of his realm to the Church, for the obvious reason that he lacked good title himself.